The white, gabled-roof Claremont hotel, which dates to 1915, sits just high enough in the Berkeley Hills to have views of San Francisco Bay and the Golden Gate Bridge. Tucked into a residential neighborhood, roughly a mile from the University of California-Berkeley campus, it hardly seems like the sort of venue to have an exceptionally vibrant tennis program—that is until you meet director Rosie Bareis, a USPTA Master Pro and holder of 11 Gold Balls, whose infectious enthusiasm for the game and its players pervades the 10-court complex. "I live, sleep, eat, drink, breathe tennis," says the Hawaiian-born pro, something that is almost essential given that the Claremont is also a club for some 1,400 local families. Not all are tennis players, of course—the club also includes two 25-meter swimming pools, a fitness center, a 20,000-square-foot spa, and some 80 fitness classes (all of them free to hotel guests) among other benefits—but there are enough to field 42 USTA teams, support a summer junior tennis camp and multiple after-school junior programs, and provide opponents from 2.5 to 5.0 for any guest seeking to play. The historic hotel itself has Old World style without being the least stuffy. Recent renovations have it looking spiffy as ever, though it retains the endearing quirk of having no two rooms alike across its entire 279-room inventory. There are also two excellent restaurants and a poolside cafe, and all of this is shoehorned into a 22-acre site convenient to Berkeley, Oakland, and San Francisco. One of only four USPTA Master pros in Northern California, Rosie Bareis has devoted her life to promoting and playing tennis. Her extensive credentials span the worlds of business, tennis teaching, volunteering, coaching, and player. That includes the coaching of national ranked juniors and USTA teams and winning 11 national championships herself, 10 of them in doubles. But what distinguishes her program at the Claremont from others is the remarkable success she and her staff have had at involving members—many of whom join for access to the spa and swimming pools—and their kids in tennis. 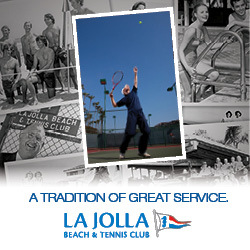 The mission statement, which is posted on the wall of the room where pros gather, reads "The Claremont Hotel, Club & Spa tennis department endeavors to include everyone who is interested in tennis or one or more of our activities." The roster includes drop-in clinics, a weekly men's night, holiday round robins, and studious game matching—a boon to guests. There are also Quickstart, kids, and junior programs, including a summer junior day camp for those as young as 7 years old that draws 30 to 50 participants each week. With kids, especially, they adopt an Old School approach: "We preach serve and volley," says Bareis. "We don't do swinging volleys." But the camps aren't just about technique and match play: woven into the fabric are discussions about sportsmanship and about handling losses as well as wins. Courts & Fees. There are 10 hard courts, on three levels. Currently six courts have lights to all should be lighted by the end of the year. Spa & Fitness Center. Named among the best in the country by Vogue, Shape, and other publications, the Spa Claremont offers a broad range of treatments and salon services in its 32 rooms, as well as pre- and post-spa options like waterfall showers, a Jacuzzi with views of the courts and San Francisco Bay, and eucalyptus infused steam rooms. Those looking to work out will find a multi-room state-of-the-art fitness center located adjacent to the swimming pool and just above the courts. Local art decorates the walls and workout rooms have views of the courts or swimming pool. Junior tennis aside, the hotel operates Kids club for those ages 3 to 10 that keeps them busy with activities and arts and crafts. Guests receive 3 hours/day on a complimentary basis (or 2 hours for those 6 weeks to 2 years). There are other seasonal options as well. No two of the 279 rooms in the hotel has exactly the same footprint. Among the mix are rooms dubbed "PURE" for their allergen-resistant treatment. The hotel has three restaurants: the casual Bayview Café adjacent to the swimming pool and overlooking the courts; the Paragon Bay and Café, an indoor/outdoor American brasserie with views of the Bay; and Meritage, the signature dinner restaurant Meritage, whose chef Josh Thomsen was mentored by Thomas Keller of French Laundry fame and focuses his menu on regionally sourced farm-fresh food. Travel Instructions. By Air: The nearest gateway is San Francisco International Airport (SFO), roughly 24 miles to the northeast. General Tourist Information. For information about the Berkeley region, visit the Berkeley Convention & Visitors Bureau website.